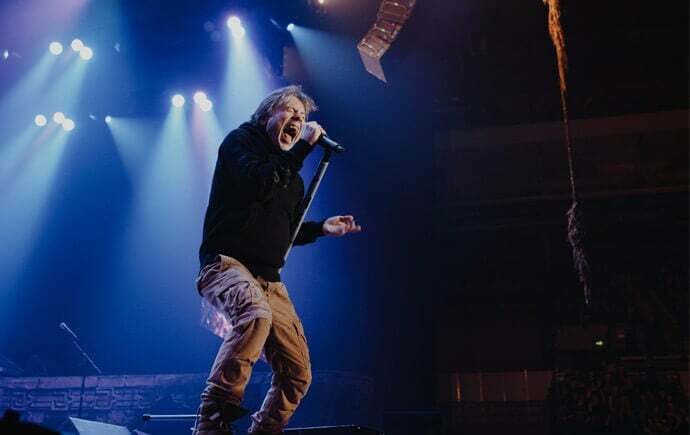 For half a dozen men hurtling into their sixties, you could forgive Iron Maiden for becoming a cabaret act a long time ago. But such is the seminal NWOBHM chieftains’ dedication to their incomparable legacy, that these heavy metal veterans continue to surpass themselves at every juncture. It’s been six long years since the band’s last Sheffield visit – perhaps even longer since some of tonight’s audience saw daylight – and the show entices the crustiest, most grizzled contingent of their diehard fanbase out from the cracks to rejoice at the Iron’s return to the City of Steel. The opening salvo of ‘If Eternity Should Fail’ and ‘Speed Of Light’ – both taken from the band’s latest album, and the tour’s namesake, The Book Of Souls – wastes little time in captivating a capacity crowd; and it is testament to the six-piece’s artistic endeavour that, almost forty years into their colossal career, these new songs sound as vital as anything from their mid-eighties heyday. The legendary triple guitar assault of Dave Murray, Adrian Smith and Janick Gers is on blistering form, but the real star of the show is frontman Bruce Dickinson, who comfortably outperforms those twenty years his junior, while barely breaking a sweat. The younger and more fair-weather fans abandon their seats to scream along to the likes of genuine classics ‘The Trooper’ and ‘The Number Of The Beast’, but it is the recent thirteen-minute-long opus ‘The Red And The Black’ that soars highest. No strangers to theatricality, ‘The Book Of Souls’ – a cautionary tale concerning the preservation of the soul – sees Dickinson sport a Mayan death mask, as he delivers arguably his finest vocal performance of the night. Following a stunning rendition of ‘Fear Of The Dark’, Eddie takes to the stage to find an adoring audience in full voice – the sight of Dickinson tearing an artificial heart from the iconic, fifteen-foot mascot, before splattering the front row with its blood, is quite something to behold. Taking into account the existence of both Metallica and Black Sabbath, it’s difficult to conclude that the Leyton sextet are the greatest metal band of all time; but on tonight’s performance, there can be no doubt that Iron Maiden’s spectacular and hysterical heavy metal circus is the finest, most thrilling spectacle of its kind. Up the Irons.